Here is your open thread for February, 2011. Initial preparatory work on the new bridge for MLR gets underway on Wednesday, resulting in a temporary detour for Esplanade users. Legend has it, if the groundhog sees his shadow, we’ll have six more lines of light rail built in the city. And the city of Beaverton is promoting a draft of its proposed civic plan, designed to tame (among other things) the infamous sprawlevard that is Canyon Road. Not muich for transit in the plan, other than improved pedestrian access to the Beaverton TC and Beaverton Central MAX stations, but lots of goodies for bicyclists and walkers in the plan. (I, for one, was kinda of hoping for at least a few exclusive bus lanes in the vicinity of Beaverton TC). With that, the open thread is now….. open. 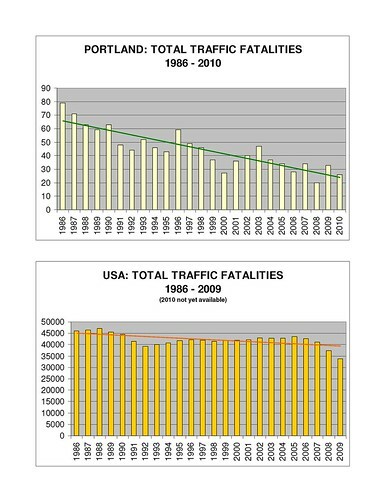 The Mayor’s office has been releasing statistics in advance of the annual Safety Summit. Here’s one that we should be proud of! But let’s not take our eye off the ball. Last year had a surge in pedestrian deaths. We still have to make the system a lot safer. One of the criticisms of Walkscore has been that it used “as-the-crow-flies” distance calculations to amenities, so addresses got credit for access to amenities that might not actually be accessible by foot (on the other side of a freeway for example). Well, that’s changing. There’s now a beta of a version that calculates actual walking routes to destinations. Very cool to see the results plotted out. Looking to State to Plug Milwaukie Gap? I heard third hand today that Metro and TriMet made a pitch to the Oregon Transportation Commission today to make a multi-year commitment of flexible funds (Federal I assume) to help close the funding gap on the Portland-to-Milwaukie LRT project. Anyone have first hand details? Abstract: While TriMet and other transit agencies serve many commuters by having racks for bikes on trains and buses, large bike parking facilities in global capitals of urban bicycling provide the key link between bikes and transit. Following the lead of European and Asian cities, the Portland region is starting to develop a network of bike-transit facilities; TriMet is piloting smart bike parking technology in the form of electronic bike lockers and “Bike & Rides”. This presentation discusses the background and planning for bike-transit integration in the region and shares insights into bike-transit travel patterns, habits, and market segmentation gained from recent rider surveys.